Internationally recognized for his groundbreaking contributions to contemporary clarinet music, praised by Musical Opinion (UK’s oldest classical music magazine) for his “constantly beautiful tone”, he starts his career at a very young age and has since “established himself as the friendly face of contemporary clarinet”, according to the Clarinet & Saxophone Magazine. His work has been described as “romantic, soulful and technically superb” and, with a repertoire that embraces more than two centuries of Western music, Luca is considered one of the most versatile musicians of his generation. Luciano has presented new works (either his compositions or music especially written/arranged for him) and rarely played music at some of the most established venues of the UK and overseas. He is mainly active as a solo artist presenting original projects via concerts/recitals and his experience includes TV and radio performances, master-classes and lecture-recitals, five solo albums, orchestra and chamber music. The Duo Lucatelle-Bartoloni, featuring pianist Daniela Lucatelle and guitarist Fábio Bartoloni, aims at broadening the repertoire for this unusual ensemble via recordings and live performances. Thanks to funds provided by the Secretary of Culture of the State of São Paulo, they recorded the CD “Sonatas and Fantasias” that featured exclusively original works for piano and guitar duo. The CD was officially launched during a concert at SESC Vila Mariana in São Paulo in July of 2014, and this performance was chosen one of the best concerts of 2014 by the Folha de São Paulo newspaper. In 2016 they toured Europe, with concerts at Festival Guitares en Picardie in France, St. Mary at Finchley Church in London, and Mannheim Musikschule in Germany. Inspired by the etymology of the word “poet” (meaning “creator” in ancient Greek), this album carries on the aesthetics of previous releases and presents clarinet works of recent years along with a piece by Luciano Berio and a bonus track featuring a composition of Luca’s for guitar and piano. 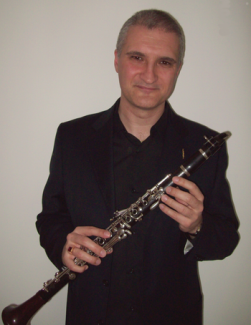 The music, recorded in London in 2015, is informed by an on-going research on extended techniques, unconventional sound production (and their application on composed and improvised music) and new music for solo clarinet that Luciano has regularly presented in the UK and overseas via premieres and educational events aimed at showcasing the full potential of the instrument. Luca’s will to explore the full range of sound resources and colours of his instrument is more clearly evident on pieces such as: Fragment #6 (premiered at St Martin in the Fields in London in 2014) using multiple sounds and the voice into the instrument; the Fantasia, exploring the possibilities of the lower and upper joints of the instrument when played separately; tracks for clarinet trio or for solo with pre-recorded instruments, in particular “Mosquito” featuring slap-tonguing techniques over a pre-recorded clarinet played without the mouthpiece; two studies, recently premiered at the National Portrait Gallery in London also part of his “Introductory Method to Extended Techniques”. The programme is completed by homage pieces to Puccini, Stravinsky (with audacious variations on his “Three Pieces”) and to Poulenc (whose Sonata has accompanied Luca since early in his career) premiered at the 2015 European Clarinet Festival in Belgium. Luca’s passion for Brazil (where he tours regularly) is evident on Divertimento #11 and the Two Miniatures recorded in Sao Paulo (by guitarist Fabio Bartoloni and pianist Daniela Lucatelle) and premiered by the duo itself in the USA in 2015.